The local ALDI seems to have half its store stocked with chips, snacks, salsa, pizzas, wings and other stuff people typically have at parties. And of course, there’s hardly any bigger party time than Super Bowl Sunday. Well, maybe World Cup. Super Bowl versus World Cup. There’s a bit of friendly controversy. Most of these extra stock items, I’ve never seen before. Of course one of the new items was the Black Bean and Corn Salsa reviewed here. I’m not sure this will be stocked again until next year. So if you have the chance, especially if you want something a little unique at your party, stop by ALDI before game time and try a jar of this salsa or maybe some lime tortilla chips or maybe both. My jury is still out for a final verdict, but this is definitely a different taste than 99% of the salsas on the shelves. 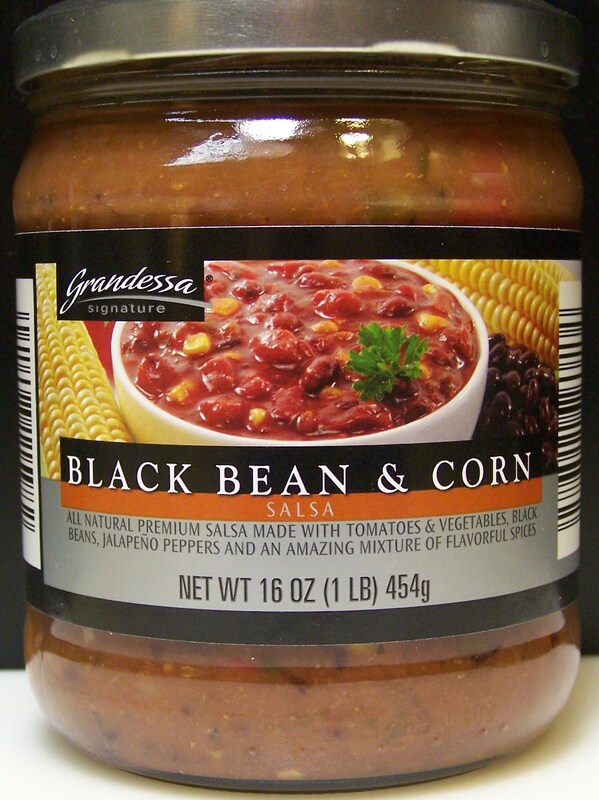 It’s even different from the few other black bean and corn salsas available. There’s a definite pleasant olfactory surprise when the top is first popped. Some of the heat and an aroma of black beans jumps out from the jar. While it’s tomato based, it’s not like the brand varieties. The texture is almost like a little black bean soup has been mixed in. Now, the label doesn’t say that, but that’s the way it tastes to me. Along with the black bean side of things, there are; chunks of tomatoes; chunks of green, yellow and red bell peppers; many spices and other flavor additions especially jalapenos. The jalapenos and heat are the biggest difference between this and the similar sounding brands. I’d rate this a medium salsa for heat. 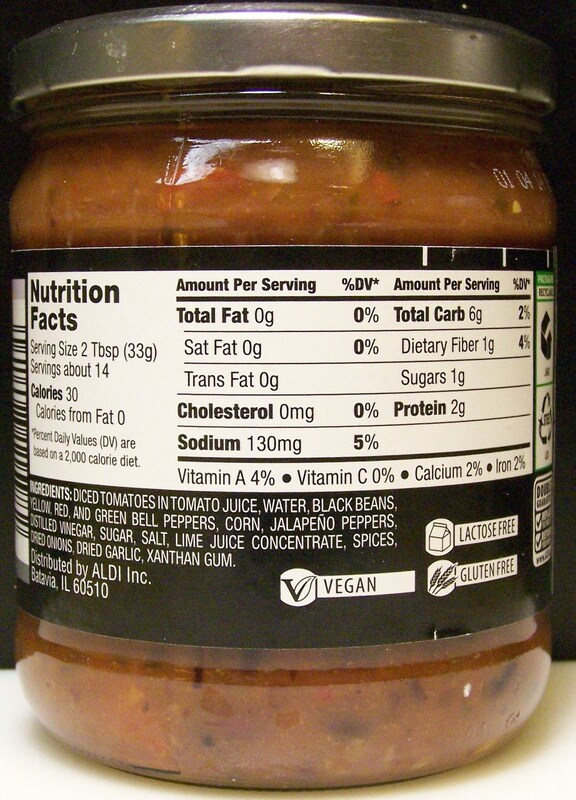 The label claims this salsa is lactose free, gluten free and vegan. It’s a winner if only just based on this. This entry was posted on 02/04/2012 at 10:00 and is filed under ALDI, Recipes, food, cooking and related items, Vegetarian. You can follow any responses to this entry through the RSS 2.0 feed. You can leave a response, or trackback from your own site.